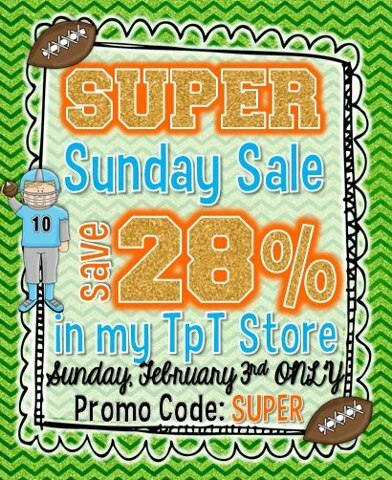 Adventures of the Polka-Dotted Teacher: Super Sunday Sale!! Erika will be getting her TPT Gift Certificate just in time for the big sale tomorrow!! In case you haven't heard...Teachers Pay Teachers is throwing an amazing sale Sunday February 3rd! Woohoo!!! I have some shopping to do! I will be putting my store on sale for 20 % off, as well as many other sellers! Enter the code SUPER at checkout for an additional 10% off for a total of 28% off! My sale has already started today and will extend through Monday! You will only be able to get the extra 10% off on Sunday. people love to enjoy their weekends after a long and hectic week, they need some refreshment for this they search different activities do in their week ends so they can get relax,they can find something from bestessays.com review as well. We can do our favorite hobby like reading, playing games and sports or any other activity that can refresh our minds. If We Can Write, Then We Can Solve! Showing Off Some Great Buys! !